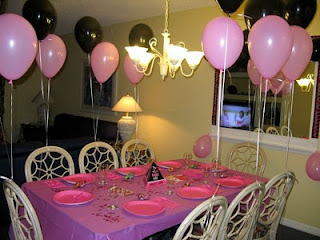 Nolan Family Adventures: Bachelorette Partayy! July 9-11, 2010: Bachelorette Party in Orlando! First, I'd like to thank all of my bridesmaids for an amazing weekend! Friday night we hung out at the hotel, ate a delicious meal, and played Heartthrob (which we were a little tooo amused by!). They did a great job decorating our fabulous hotel room! 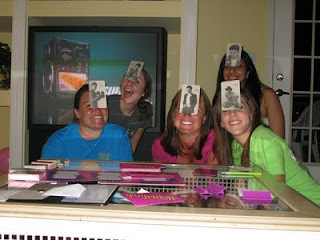 After playing Heartthrob a couple of times we decided to guess which guy we had on our head, lol. Saturday we woke up and went to Old Town to take old time photos. 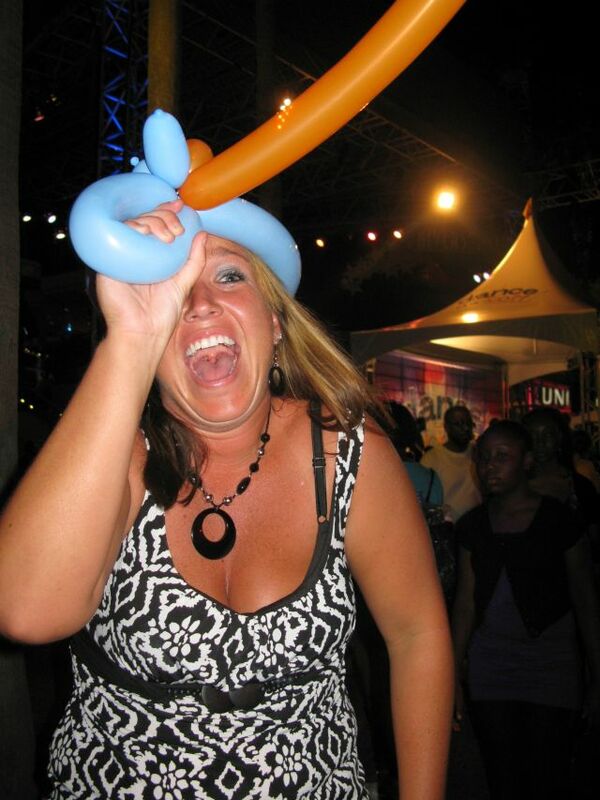 I'll have to post the pictures once I scan them on to the computer...they are pretty funny. We have one funny and one serious one of us all dressed up as saloon girls. After the photos we went to the outlet mall and found shoes for all the bridesmaids to wear! We got SO lucky that they had everyone's size...and they were relatively cheap --- SCORE! Saturday night, we got dressed up and went to City Walk. 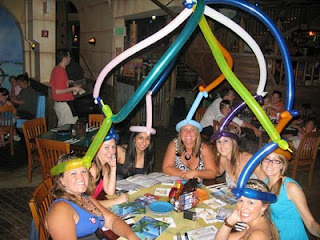 We ate dinner at Jimmy Buffet's Margaritaville. 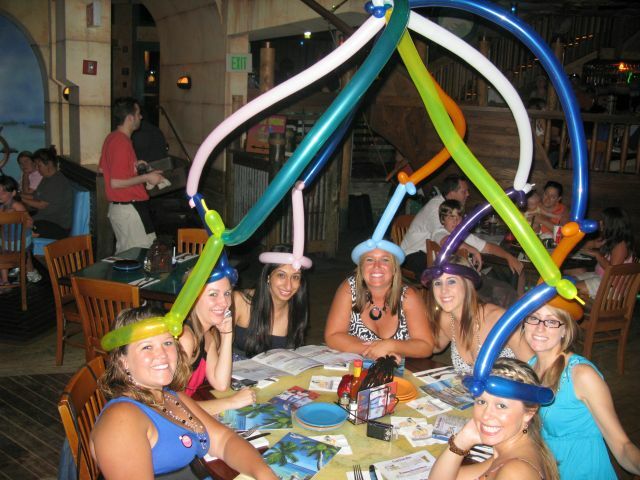 They gave us each our own balloon hat and then ended up connecting them all together. It seriously amused us (and a BUNCH of other people) all night. I mean...we couldn't even get out of the restaurant without people wanting to take pictures with us. 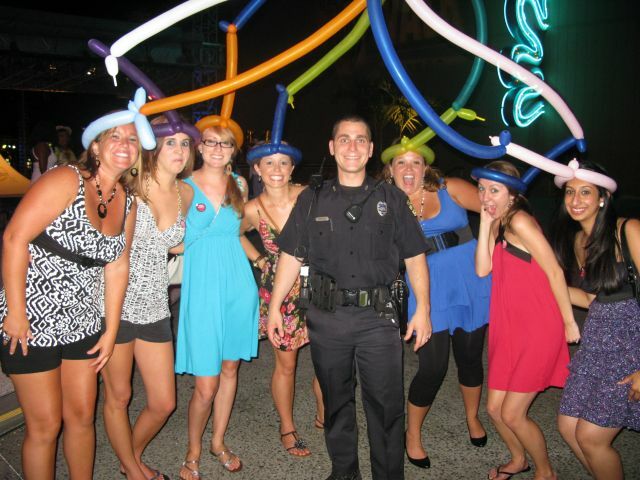 So we pretty much walked around City Walk all night taking pictures, dancing, and having a blast. Right after we got connected! Hanging with the popo--he told us not to make a face. 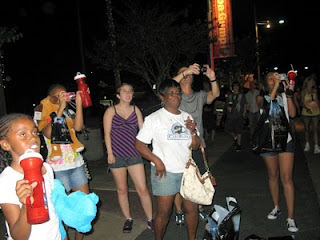 A small sample of the people taking pictures of us/with us. Sunday we relaxed. Heather, Namrata, and I went shopping and then had to drop Heather off at the airport. Namrata and I came back, hung out at the pool/jacuzzi, got some pizza, and lounged. Great end to a great weekend (Wow I need to learn some more adjectives! ).